I am a strong proponent of daily writing, especially on days that I fail to write. The NCFDD (of which MSU is a member) has a ton of resources, organized around success in research & academia [particularly daily writing]. Click here for more information. The study on daily writing and productivity is summarized nicely at the blog “Get a Life, PhD” and is also quoted below. “The Test: Does Writing Accountability Work? The third group agreed to a strict accountability plan. They scheduled five writing sessions a week for ten weeks, and kept a log of creative ideas for writing. To ensure that they would write every day, the members of this group gave Boice a pre-paid check for $25, made out to a hated organization. If they failed to write in any of their planned sessions, Boice would mail the check. The idea behind this group was that forced writing would require the group to come up with creative ideas for writing. 1) Abstinent writers produced an average of 0.2 pages per day, and only one idea per week. 2) Spontaneous writers produced an average of 0.9 pages per day, and one creative idea every two days. 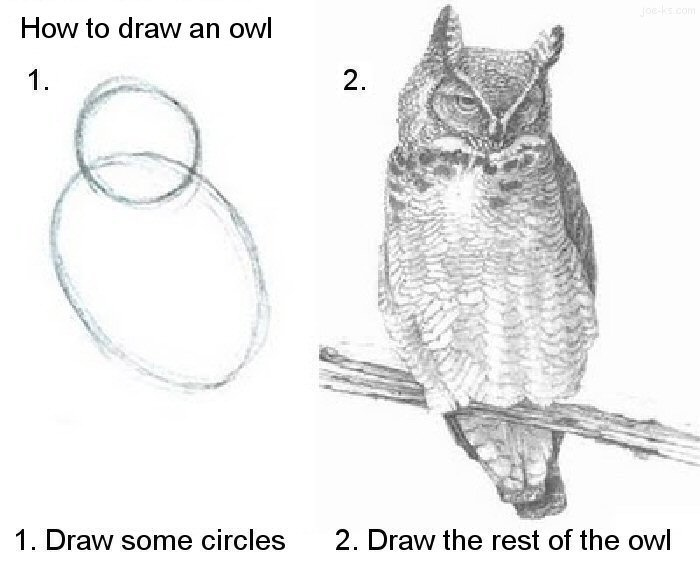 To close, one of my favorite metaphors for “How to Write” is summarized by the following “How to Draw An Owl”. I’ve always been skeptical of Boice’s small experiments, which are often used to denigrate so-called “binge” writing. But this I can get behind: whether your writing session are large or small, they have to be frequent. (And frequent large are better than frequent small, just unrealistic!) The most important thing is simple: if you aren’t writing, it’s magical thinking to expect that writing will result!